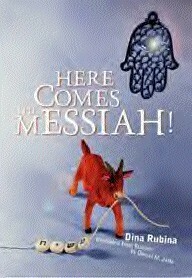 Daniel M. Jaffe - Here Comes the Messiah! Daniel translated Dina Rubina's satire of Russian emigre life in Israel. The original Russian novel was nominated for the Russian Booker Prize, and was a best-seller in Russia. "Crammed with idiosyncratic characters, jazz-like riffs on their various schemes and daydreams, and luminous descriptions of the Israeli landscape, 'Here Comes the Messiah!' is an exceptional reading experience." Miriam Rinn, Jewish Standard. "Although likened to Babel for her penchant for mockery, to Gogol for being derisive yet charitable toward everyday people, and to Dostoevsky for certain stylistic mannerisms, Rubina is a literary original....At times Rubina's prose, which in Daniel Jaffe's fine translation resonates with Russian cadences, is as harmonious as a Tchaikovsky concerto. Other times it is as cacophonous as a scherzo by Stravinsky. But even when Rubina's writing is contemplative, it crackles with energy." Marlena Thompson, JBooks.com.